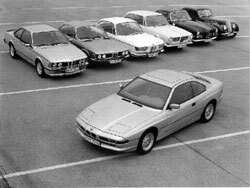 The E31 Registry represents the dedicated worldwide BMW 8 Series owners who believe that the BMW 8 Series will become one of the pre-eminent sought-after collector cars from the late 20th century. To that end, thousands of hours of research and data collection have occurred to ensure future preservation efforts. Provide a centralized community supporting the documentation and preservation of the 1989-99 BMW 8 Series (engineering platform E31). 8Coupe.Com provides centralized advocacy, information continuity and support of BMW 8 Series ownership through a secure online repository. The E31 finally gets a list. Thanks for making it available. So much is misunderstood about the 8 series because it is so far out of the mainstream. Most people simply haven't had an opportunity to drive one, but if they did, you wouldn't hear as much negativity as you do about them. The E31's mission and purpose has never been understood by the masses. From BMW's perspective, it represented the pinnacle of their engineering ability at the time it was introduced. Unfortunately, they chose to go way up-market with it and it became totally unaffordable for most of the car buying population. From a driver's perspective, however, this model represents the best BMW grand touring coupe money can buy. And it remains so today. And better yet, great examples are becoming available on the used car market at reasonably affordable prices. Drving an 8'er is sheer pleasure as the car is incredibly stable, solid, and powerful. Whether you're loafing around town in traffic, or barrelling down the interstate at 90 mph, you always feel in complete control, with vast amounts of reserve power always available at your beckon. Is the 8 the best handling BMW? No, of course not. It was never intended to be. Is it the fastest BMW? Well, if top end matters, then arguably the 850CSi very well may be. Is it one of the safest BMW's? Very likely. It's a solid, heavy car, and will win most impacts with anything short of a Suburban. Is it the cheapest BMW to maintain? No, it is an expensive car to maintain and insure. Is it the best looking, most stylish BMW ever? Without a doubt.